The Bullers provides an ideal nesting site in spring for many varieties of seabirds, including Kittiwakes, Puffins, Fulmars, Shags, Razorbills and Guillemots along with the more usual Herring Gulls and Greater Black Backed Gulls. Eider ducks may also be seen here, feeding from the rocks at the waters edge, and Gannets are frequently seen passing en route to their colonies north at Troup Head and South at Bass Rock. Oystercatchers and Purple Sandpiper feed along the shoreline in the bay. 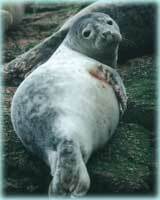 Grey seals may be seen in the bay, and dolphins are often seen passing by offshore. The main species of birds to be seen are described below. The Puffin, always the most popular bird for tourists, lays its eggs in burrows along the steep grassy banks of the cliffs, particularly on either side of the promontory known as the Camels Back. They return to the same area each spring, find their mate and stay until about August, when the fledglings emerge (usually at night) and make their way to the sea, where the parents will continue to feed them. 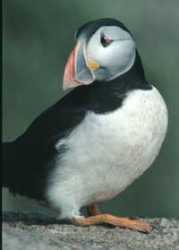 Puffin numbers at the Bullers have shown an increase in recent years. The best time to see them is in the early evening, especially if it’s sunny, when they seem to enjoy sitting outside their burrows and just watching whatever is going on. Walk south along the cliffs towards Cruden Bay for closer views, but take care at the edge. 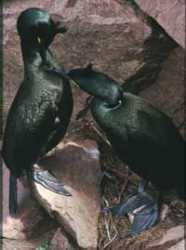 Shags are large birds, similar to Cormorants, but preferring the sea coast to inland waters.They may be found on the cliffs all year, but take on special plumage in Spring, when they display themselves in glossy green feathers and develop a fine crest. Their nests, usually towards the base of the cliffs on the wider ledges, are large and ramshackle and often decorated with various pieces of flotsam such as plastic bottles and fishing nets, and sometimes flowers from the clifftops! They like to congregate in groups on outlying rocks and skerries, often standing with their wings outspread to dry. It seems strange that a water bird should not have waterproof feathers, but apparently this is because they can swim faster underwater and go deeper without air trapped in feathers… there’s always a reason for these things! 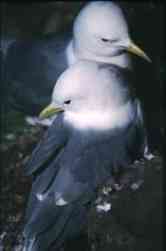 The most common bird on the cliffs in Spring is the Kittiwake. If you wonder why it’s called a Kittiwake, just listen to its call… a continuous “kitti-waak, kitti-waak” sound which permeates the cliffs. This is a seafaring Gull, and the only Gull to construct a proper nest. They congregate in colonies in favoured areas, sometimes in huge numbers (see Fowlsheugh Cliffs south of Stonehaven). Kittiwakes spend most of the year at sea, but return to the same site each spring to construct their nests from mud and grass, attached to the narrowest ledges of the cliff or any small projection. Here they will lay 2 or 3 eggs and incubate them, sitting tightly for protection from predatory gulls and the occasional stoat (I have seen a stoat climbing the cliffs at the Bullers looking for eggs in the nests). When the chicks are hatched, the parents feed them by catching small fish and regurgitating the resultant semi-digested material into the chicks beak. Yum. They suffer a good deal of predation from the Herring Gulls and Great Black-Backed Gulls who also nest on the cliff ledges, these much larger gulls frequently snatching eggs and small chicks from the nest and carrying them off. This is a brutal thing to see, but don’t judge them too harshly; they are only animals and they have to feed their young too. The Kittiwake chicks (those that survive) fledge about the end of July and both fledglings and parents leave the cliffs to return to the sea, although young Kittiwakes can often be seen along the coast at any time of year. There are more Kittiwake colonies on the cliffs to the north of the Bullers, in the Longhaven Wildlife Reserve. 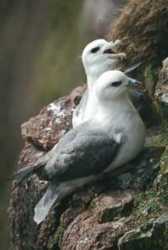 Another common bird along the cliffs at any time of the year is the Fulmar. Although similar in appearance to a Gull, the Fulmar is actually of the petrel family, which includes the Albatross, and is recognisable by the tubular structure on its upper beak. Fulmars, like many seabirds, are very long lived; a bird ringed 25 years previously, when already an adult, was caught again by the same man, and looked no different from when first picked up, which is more than could be said for him! From this it is clear that the birds can easily reach an age of 30 years or more; their normal life span is not known. Fulmars seem to be very inquisitive; if you sit at the edge of the cliff, you will often find that they will sail past you at eye level, just taking a look it seems. They also seem to enjoy sailing along by the cliff face, past each other’s nest sites, cackling to one another and occasionally getting into minor spats as a result. Sailing is an appropriate word; they rarely flap their wings, preferring to just glide. Fulmars are not prolific breeders (another indication of a long life span) – they lay only one egg, usually just on a grassy ledge of the cliff, and some years they don’t even bother with this. The female incubates the egg for about 3 weeks while being fed by the male, after which they take it in turns; and it always seems to me that they must sit on their chick until it is quite large, for you will rarely see a very small one. When you do see them, they are large and fluffy, and often left to fend for themselves it seems. And they can; the Fulmar is especially noted for its method of defence, which consists of spitting sticky, foul-smelling oil at any intruder foolish enough to approach too close, and they develop this noxious facility from quite an early age. Although most birds have no sense of smell, this technique effectively protects them from predatory gulls because getting your feathers covered in sticky gunge could be potentially fatal, and I’ve never seen a gull tackle them on land. (I did once see a particularly malicious Herring Gull dive on a Fulmar in flight and peck its back, for no obvious reason other than sheer badness – although of course one should never anthropomorphise about animal behaviour…). Guillemots are a member of the Auk family, like Puffins, but instead of nesting in burrows they gather together in large numbers along ledges and the lower slopes of the cliffs, looking very much like miniature penguins. Guillemots lay a single egg which is elongated to help prevent it from rolling off the ledge; their young leave the ledge before they can fly, by jumping into the sea, and continue to be fed by the parents until they can better fend for themselves. Although clumsy when landing and waddling on the ledges, guillemots are excellent swimmers and have been seen on cameras at oil rigs fishing at depths of up to 300ft. 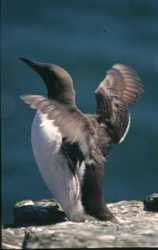 They are not great at flying though; at the Bullers, guillemots frequently come in too high and miss the cliff completely, crashing in the fields and amongst the cottages. Generally they don’t come to any harm – they just have to struggle back down the slope to the sea, because they can’t easily take off without having a ledge to jump from or a very long runway. If you have binoculars and look carefully, you may see that some guillemots have white borders around their eyes – this is a variation called a “bridled guillemot”. There tend to be more of these the further north you travel, and there are quite a few at the Bullers. Another member of the auk family, Razorbills are similar in appearance to Guillemots, but have a sideways flattened bill with white flashes, and are a deeper black colour on top where Guillemots are dark brown.They tend to nest higher up the cliff, in hollows or on small ledges, and in separate pairs rather than all together as the Guillemots do. 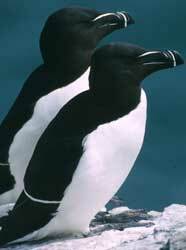 They seem to be better fliers too – perhaps because of the greater accuracy needed to find their nest site – I’ve never seen a Razorbill crash on the cliff top.Similar in habits too, Razorbills may be seen on the cliffs from about March through July, after which they return to the sea. Usually at least one or two Grey Seals may be seen swimming in the bay, and at low tide the seals and pups may be found hauled out onto the rocks along the edge of the bay. The pictures here are of cubs; cute aren’t they? Sometimes you may find one on the beach, as they aren’t as alert as the adults and may not see you coming; stay away, they have big teeth and enough tartar to delight whole teams of dental hygenists. A bite from one of these is serious. And their breath smells awful. In addition to seals, you may sometimes see dolphins out to sea, especially on fine days when the water is not too rough. Look for them as they leap. Other mammals may also be found along the cliffs from time to time – stoats, moles, weasels, foxes and Roe deer are occasionally seen. All pictures on this page were taken by myself, mostly at the Bullers or other sites on the North East coast.